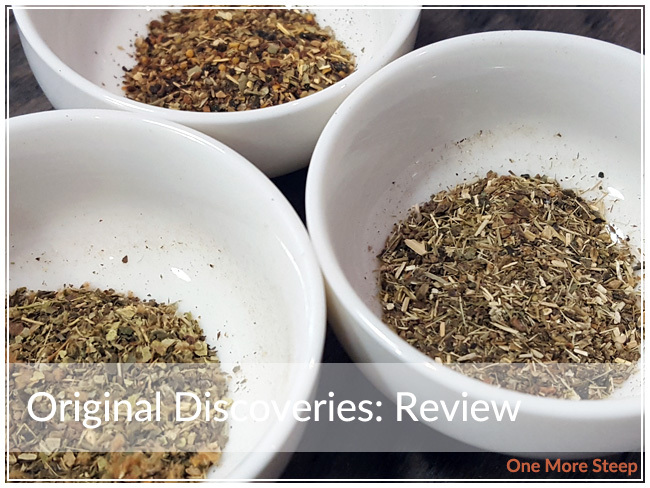 Mint and Honey has provided me with Northern Delight’s Original Discoveries (Five-Blend Assortment) the purposes of providing an honest review. 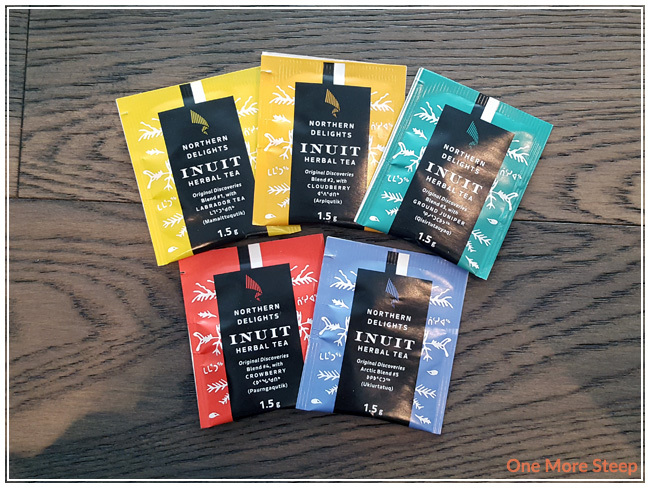 Northern Delights puts together a collection called Original Discoveries Five-Blend Assortment, which is five of their Inuit herbal tisanes in one handy-dandy box so you can try them all. These herbal infusions consists of leaves, stems, berries, and blossoms from the Arctic that are harvested by hand and dried with traditional methods, and then blended with other ingredients. All of the blends are produced by Avataq, which is part of the Avataq Cultural Institute – an Inuit owned non-profit group that works to protect and advance the language, culture, and identity of the Inuit people. While I was born and raised in Canada, I haven’t had the opportunity to explore northern Canada yet so it’s nice to get the chance to explore the flavours of natively grown plants. You can purchase the full assortment in one box, or boxes with one blend each. Each herbal blend comes in an individually packaged sachet, and they’re colour-coded. 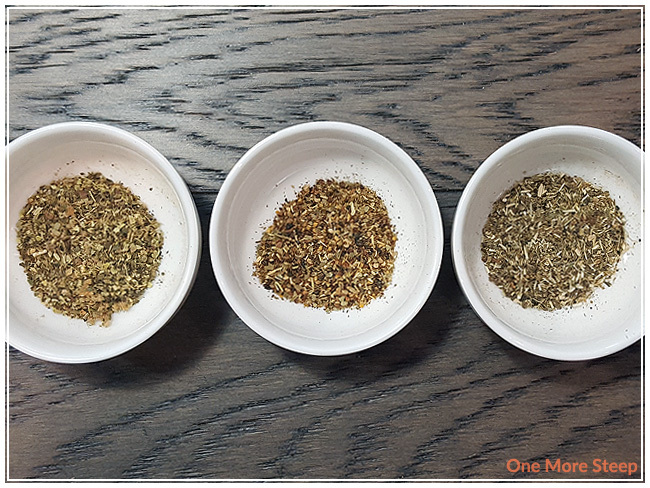 The first three blends are Labrador Tea, Cloudberry, and Ground Juniper. Labrador Tea consists of bearberry leaves, peppermint leaves, Labrador tea leaves, licorice root, eucalyptus leaves, bitter fennel seeds, coltsfoot leaves, and ginger root. The smell from this sachet is quite subtle, I can smell the peppermint, licorice root, and ginger, I’m not sure what bearberry or coltsfoot leaves are supposed to smell like, so I’m not sure if they’re supposed to be subtle ingredients. Cloudberry is made up of sarsaparilla root, fenugreek seeds, carob, cloudberry leaves, roasted chicory root, cinnamon bark, maté roasted leaf, and natural flavours. I mostly smell the chicory and the cinnamon from the second blend, there’s something quite warm feeling from the aromas that I get from the dry leaf. And the ingredients in Ground Juniper are echinacea purpurea herb, red clover flowers, juniper berries, ground juniper, burdock root, lemongrass herb, lemon balm herb, and spearmint leaves. 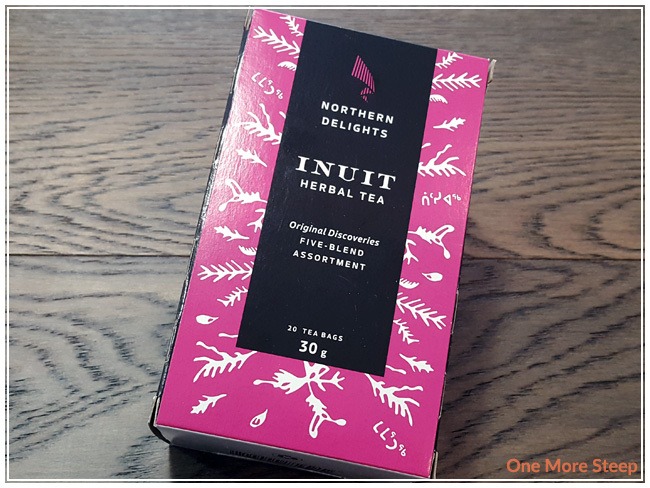 For this third Inuit Herbal Tea blend, I primarily smell the lemon balm, lemongrass, and mint fragrances – they make for a very bright and fresh-smelling fragrance. From left to right: Labrador Tea, Cloudberry, and Ground Juniper. The fourth and fifth blends are Crowberry and Arctic Blend. 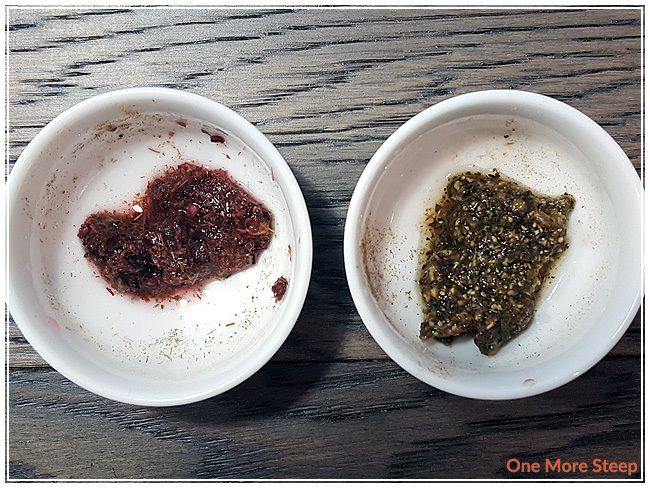 Crowberry has hibiscus flowers, lemongrass herb, birch leaves, crowberry leaves, natural flavours, juniper berries, citric acid, cinnamon bark, red poppy flowers, star anise fruit, licorice root, and cloves. I can smell the star anise, cinnamon, and licorice root. 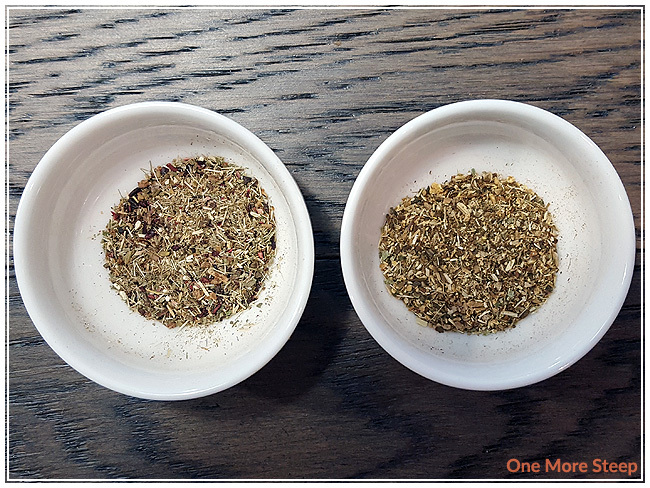 There’s something subtle about this blend that reminds me a lot of walking into a Chinese/eastern medicine shop – something slightly medicinal going on with this blend of herbs. Lastly, Arctic Blend is mad up of small Labrador tea, echinacea purpurea herb, marshmallow root, peppermint leaves, elder flowers, chamomile flowers, cinnamon bark, ginger root, cloves, and coltsfoot leaves. I found this blend to have an interesting aroma, I can smell the ginger and cinnamon, with a hint of mint in the background. It makes for an interesting blend. 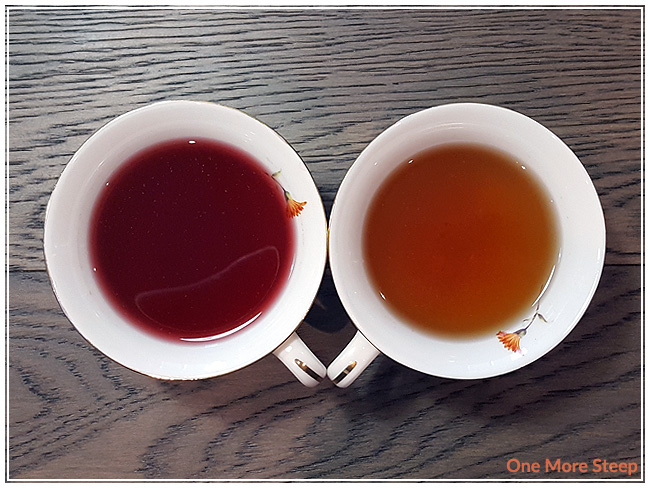 From left to right: Crowberry and Arctic Blend. I didn’t find any preparation instructions on the packaging, so I opted to steep each tisane the same way. 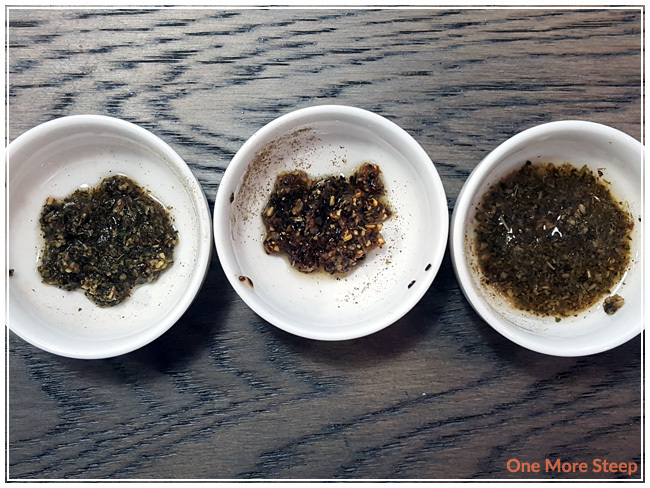 For all the initial steeps, I used 93°C (200°F) water and steeped each sachet for 5 minutes. Labrador Tea steeps to a nice orange colour. It has a nice peppermint and ginger aroma to it. When I drank it, I noticed that there was a subtle bitterness at the end of each sip. Not overwhelmingly bitter to the point where I don’t want to drink it, but just enough to make it notice it. I did wind up adding a little bit of honey to Labrador Tea and found that it helped to temper the bitterness down to make it more enjoyable. Cloudberry is a warm golden brown in colour, and has a great aroma that is primarily that of the cinnamon. On first taste, it reminds me of chocolate. There’s something about the combination of ingredients that makes me think of cinnamon and chocolate . 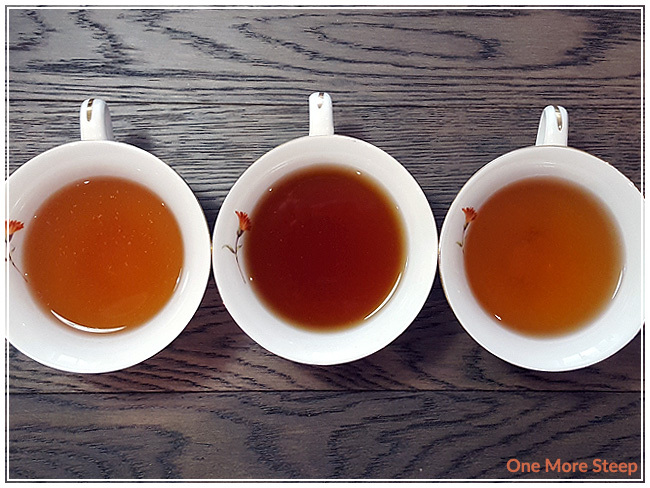 Cloudberry has a pleasant sweetness to it and made an enjoyable cup with its first infusion. Ground Juniper steeps to an orange that’s very similar to Labrador Tea. Unsurprisingly, Ground Juniper has a mint and lemongrass aroma to it. I can definitely taste those two key ingredients when I drink it, but I also noticed that it has a funny mouthfeel to it, it kind of coats the mouth and feels just a little bit of freshness at the end of each sip – I’m wondering if I can attribute that to the mint in the blend. Crowberry steeps to a beautiful deep pink and (thankfully!) it doesn’t smell the same as the dry leaf. Where the dry leaf reminded me of the inside of an eastern medicine shop, the steeped herbal infusion has a much brighter aroma to it that smells fruity. This deep pink tisane has a fruity taste to it, with a nice dose of tartness that causes a bit of mouth puckering to occur. Because of the tartness, it adds a bit of a punch behind the flavour. Arctic Blend steeps to a deep orange, similar to Labrador Tea and Ground Juniper. There’s a mild minty aroma to this one. I fond the flavours were a little bit sweet, a touch of mint, and something that resembles ginger. I wish the ginger was more present, it wasn’t as strong as I would have liked since it’s missing the heat and spice from the ginger. I attempted resteeps of all five of the Inuit herbal infusions. The ones that I felt still had a good amount of flavour were Cloudberry, Ground Juniper, and Crowberry. They still had a good amount of colour and flavour to make it worth the time to resteep. The other two (Labrador Tea and Arctic Blend) kind of fell short on the flavour in comparison to the initial steeps.